Until the 1960s, trains departing Davenport towards Manchester passed rather more railway installations than can be seen today. The present car park was once a siding where coal wagons were unloaded, and a little further on at the point where the line starts to curve to the right there was a signalbox called 'Davenport Junction' controlling the junction of the line, opened in the 1880s, which continued straight ahead, and over the top of the Stockport - Crewe line, to join the Stockport - Altrincham route at a point known as Cheadle Village Junction. This line enabled trains, mostly goods trains, from the Buxton direction to head west towards Chester and Liverpool. Because of the steep gradient either side of the main line bridge, this little line was known by local railwaymen as 'The Khyber' after the mountain pass between Pakistan and Afghanistan: British forces built a highway marched through the Khyber Pass to launch an offensive against the Afghans in the Second Afghan War (1878-79) and the area was very much in the news during Victoria's reign. By the 1960s, railway goods traffic was on the decline, and it was decided to concentrate the remaining trains on the parallel 'Midland' route, avoiding the line through Davenport which had always been very difficult for freight trains, thanks to its very steep gradients which meant that many trains had to be 'banked' - pushed by another locomotive to get them up the hills. 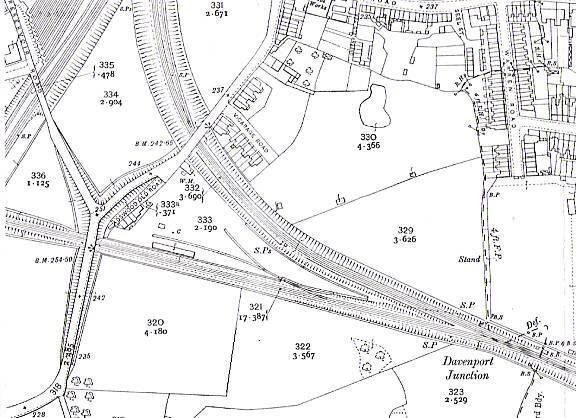 In January 1965, the goods depots at along the line closed, although for a while afterwards this part of the 'Khyber' line was retained as a siding for coal wagons serving the Co-operative Society premises in which lay between this line and the curve towards Stockport. Though freight trains dwindled away soon afterwards, and the 'Khyber', by then reduced to a single through line, officially closed as a through traffic route on 1966. I took this picture around about the time of closure 40 years ago, on one of my first solo 'railfanning' expeditions. I was standing on the bridge which carried the road over the 'Khyber' line just before the line bridged the Crewe line. 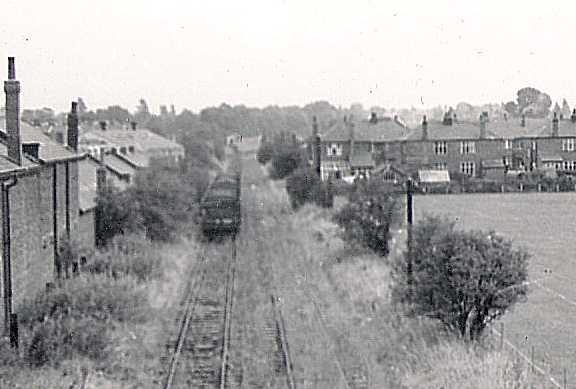 The Co-op buildings are on the left, with wagons of coal awaiting unloading; the houses beyond the playing field are in Shirley Grove, off Roslyn Road. The single through line is very overgrown. This picture was taken by Helen Hardwick in December 2005, from as near to the upper picture as can now be achieved. 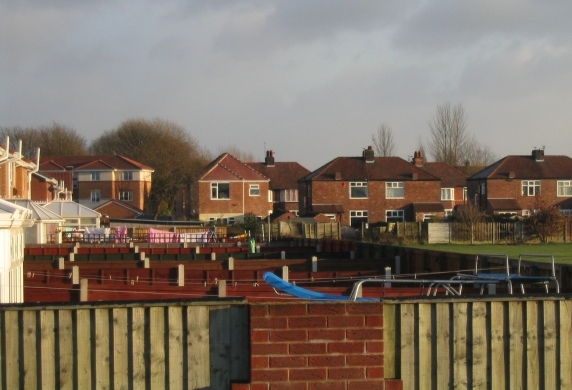 The road bridge (with its associated embankments) no longer exists, so it was necessary to stand just above the original level of the railway track; the path of the line now lies under these houses and their gardens in Newsham Road. The houses of Shirley Grove and the recreation ground still seem to be flourishing. This Ordnance Survey map from 1907 shows the area in the early days of the suburban building boom. The bridge from which the old picture was taken is centre left of the extract. Shirley Grove and whole Roslyn Road area are still in the future. Vicarage Road has its first few semi-detached villas; it was later extended all the way alongside the railway to the boundary of the sports fields. The 'Co-op' sidings are shown, although most of the buildings there must have been built later. Also yet to appear was the section of Beech Road between Warren Road and Adswood Road.